QuickShow is especially designed for first time and part time laserists. QuickShow isn't just about a better user experience. It also has advanced technology such as the all-new Beyond calculation engine. Beyond automatically takes care of scanner optimization and color mixing. In tests, QuickShow produced noticeably better image quality. USB cable, to connect your computer to the Flashback 3 boxSuch as accurate perspective and true hidden-line removal are perfectly realized. No additional work is necessary by the artist. All that is required, is that the artist 1) know 3DSM and 2) have a basic understanding of laser requirements, such as a low object count and relatively simple objects. .You can do basic shows right out of the box. All you have to do is click on cues, or press keyboard keys, to display them in time to the music. 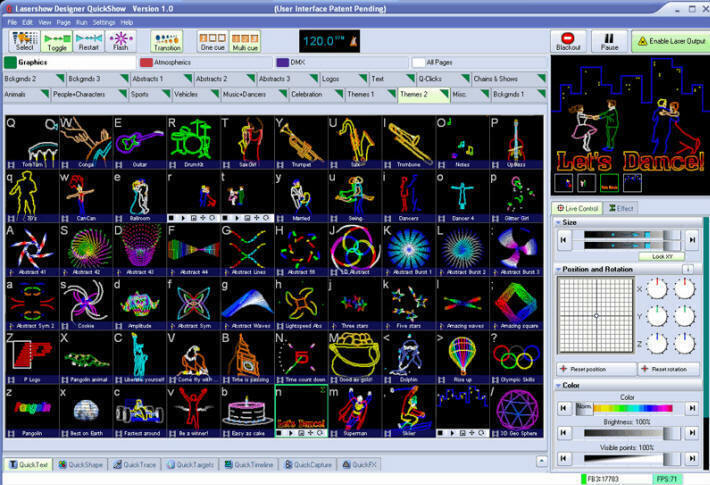 QuickShow comes with nearly 2000 pre-loaded graphics, animations, beam effects and abstracts. .But there is far more power in QuickShow than simply triggering cues. The next level is the unique QuickTools, which are used to make custom cues such as auto-traced artwork, text, and beam bounces. For example, the QuickShape tool (discussed below) makes it easy to create abstracts and beam effects (cones, fans, planes, etc.). .Finally, for the ultimate in customization, use advanced editors for professional-level features such as cue layering and sequencing, automatic beat triggering, timelines for syncing to pre-recorded music, triggering DMX channels, and controlling up to six projectors.